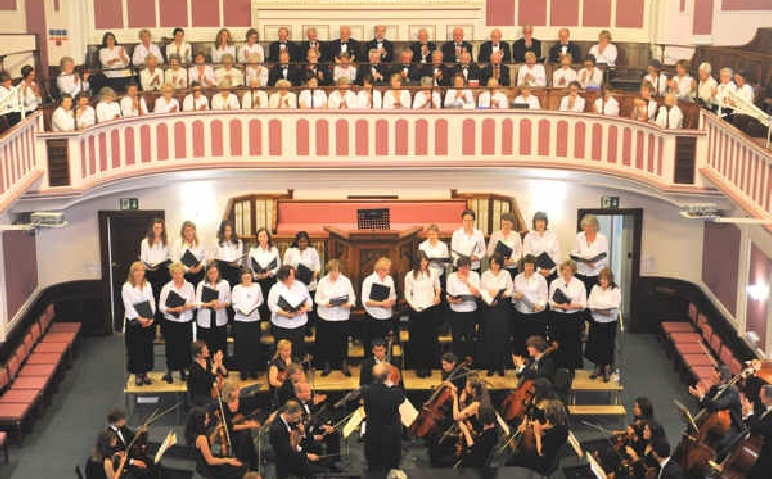 On Saturday evening, April 25th 2009, the Jersey Festival Choir presented their annual spring concert at St. Helier Methodist Centre. Once again we were sponsored by the ever-generous AIB Jersey who helped us to perform with a "flamboyant variety of local artists, choirs and orchestras". Joe Moyniham, CEO of AIB Jersey said "On behalf of AIB Jersey, I would like to reiterate our support for the Festival Choir and wish the concert organisers and the artists every success"
The choir’s main focus of the evening was Pergolesi’s ‘Stabat Mater’- a poetic oratorio describing in words and music the agony of Mary as she watches her son on the cross. A ‘Marian’ theme seemed to emerge naturally from this, and the first half of the concert featured several pieces of music about the mother of Christ. We were delighted to be joined by the Holmchase Choir. 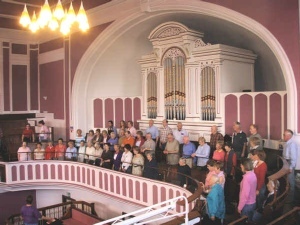 The concert opened with the choir and organ trumpeting the joy of singing. 20th Century welsh composer William Mathias’ ‘Ad majorem dei gloriam’( ‘for the greater glory of God’) had a fanfare-like quality and was a fitting and exciting start to the interesting and varied programme. At this point the performers were joined by the guest conductor for the evening - David Lawrence - a most inspirational conductor and a favourite with the choir and Jersey audiences. David features regularly on BBC TV’s ‘Songs of Praise’. A choral arrangement of Bach/Gounod’s ‘Ave Maria’ followed. 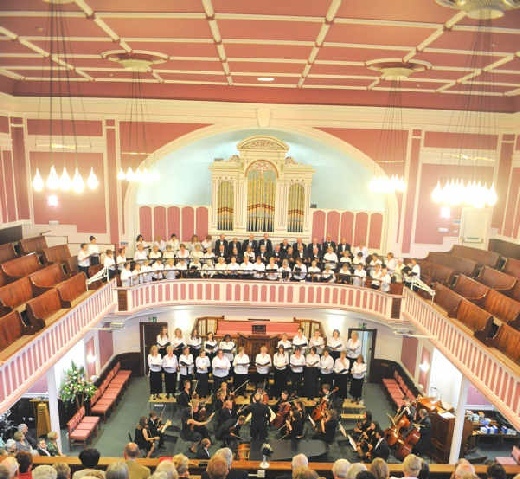 The choir was joined by the Holmchase Choir and the Jersey Chamber Orchestra strings, with Julian Wilkins (organist) on piano. 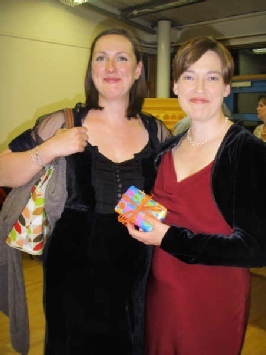 This proved a delightful addition to the concert as did the Holmchase rendering of Verdi’s ‘Laudi alla vergine Maria’. 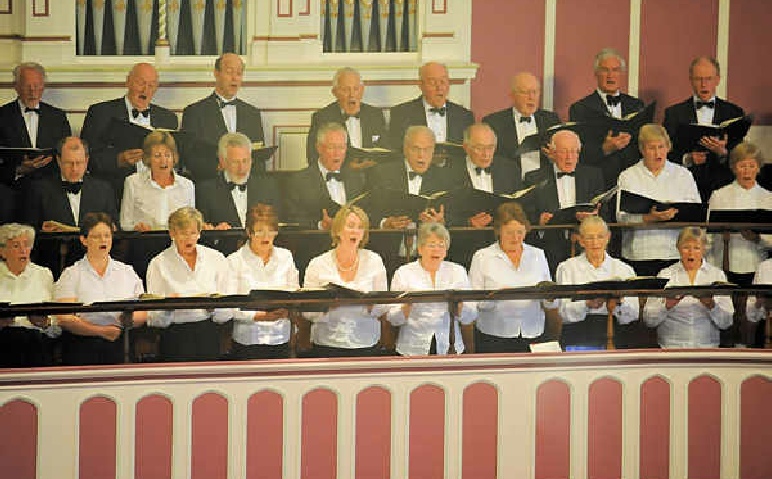 The purity of this choir’s unaccompanied singing had the audience spellbound. Mascagni’s grand ‘Easter Hymn’ -‘Rejoice for the Lord has arisen!’ with organ, string orchestra, professional soprano and alto soloists and including both choirs was an uplifting and spine-tingling ending to the first half! Then came the main thrust of the evening - ‘Stabat Mater’- by the Italian composer Pergolesi- completed shortly before his death at the tragically young age of twenty-six. One of the highlights was a most beautiful rendition of the aria ‘Vidit sum dulcem natum’ where the soprano sings of the dying breaths of Christ on the cross -strings and voice most magically marrying together the full emotion of the mother - her pianissimo marking His death was a truly memorable moment of poignant and controlled stillness. The choir rose to the challenge of this deceptively difficult piece, and the pathos of the message rang through to the final glorious ‘Amen’- leaving all with the feeling of hope that ‘our soul too may be granted the glory of heaven’. 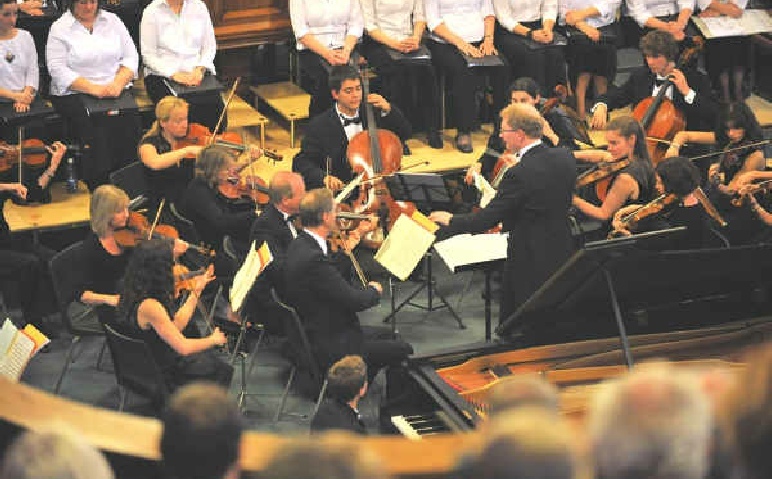 Choir, orchestra - with its augmentation of young Madeiran players – soloists and audience were truly united and inspired by David Lawrence’s sensitive and dynamic conducting. 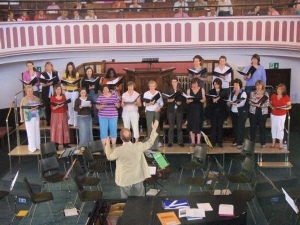 This is the final concert of the season for the Festival Choir but those who would like to join will be very welcome to come to its first meeting of the new season at Le Rocquier School at 7.30 on Wednesday 9th September 2009.